Hacking a printer’s WiFi module. | My humble Blog. ← Halt and Catch Fire. Hacking a printer’s WiFi module. A cousin of mine dropped over to my house an out of economical repair inkjet printer. HP Photosmart Plus All-in-One B209a to be exact. I dismantled it and kept the main board and the motors. While trashing the left overs I noticed the WiFi logo on one of the plastic covers. Immediately picked up the main board and there was a daughter board. I took the board out (standard 0.079″ [2 mm] pitch connector) and saw an Atheros chip. AR2524-AQ1C. 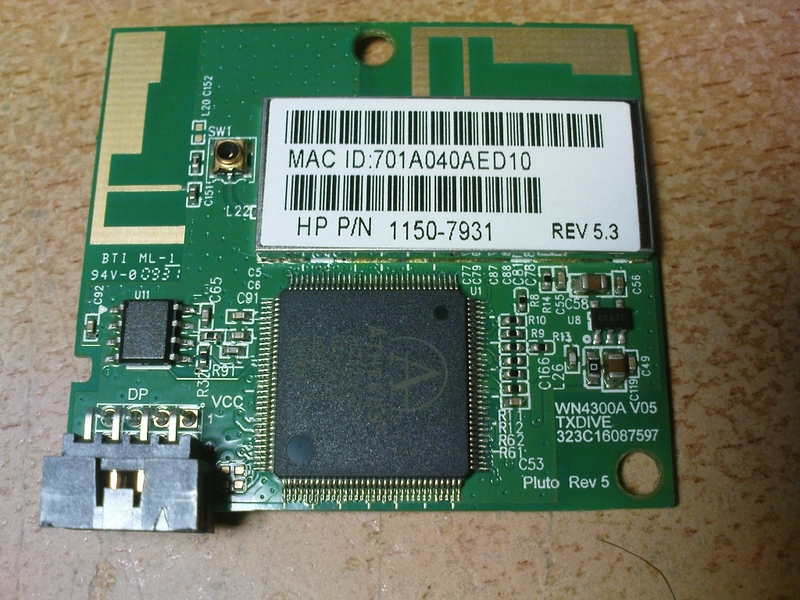 I knew by heart it was an Atheros USB WiFi chip. A free WiFi USB dongle maybe? Lets find out. The first thing I had to do was to have a look at the connector. 8 pins in total. Locating Vcc was piece of cake! Pins 1 & 2. Ground was also trivial. Pins 3,4 and 8. Pins 5 & 6 were connected to a tiny ferrite transformer, so one must be D+ and the other D- of the USB differential data bus. The only one remaining to identify was pin 7. I thought it should be something like module enable/disable pin. Pull it low/high to Enable/Disable the module or something similar. I decided to leave it unconnected. I had also to convert the USB’s +5 volts to +3.3 volts for the module. So I bodged together a 3.3 volts voltage regulator. The next thing to do was to find an old USB cable and bodge everything together. Time to connect it… I immediately run lsusb. Success! 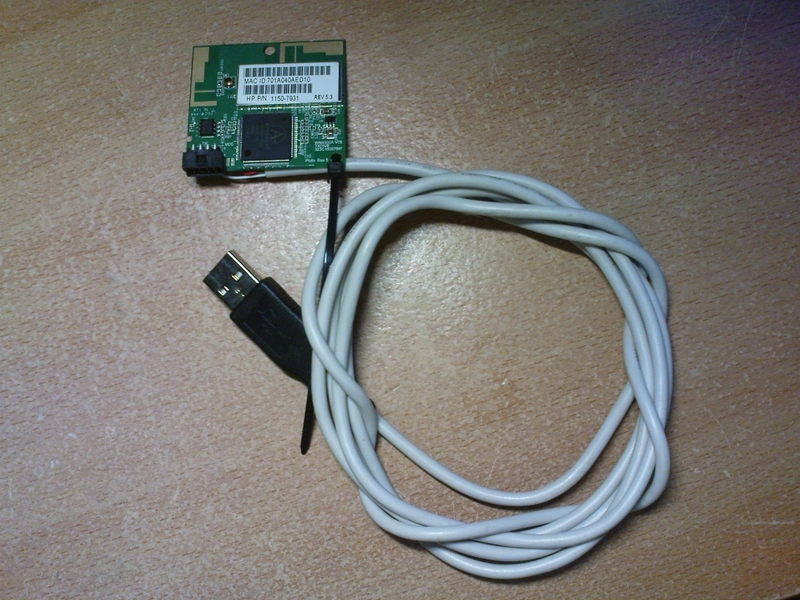 After that I installed the z1211-firmware (Firmware for the in-kernel26 zd1211rw wireless driver). There you go. A free WiFi USB dongle. Actually I am writing this post while connected to the Internet using the salvaged WiFi card. This entry was posted in Electronics, Miscellaneous, Science and tagged 0ace:1215, 802.11, AR2524, AR2524-AQ1C, Atheros, B209a, HP, HP photosmart, HP Photosmart Plus All-in-One B209a, printer, usb, usb wifi, usb wifi dongle, WiFi, WiFi module, WiFi printer, ZD1211, ZyDAS. Bookmark the permalink. 28 Responses to Hacking a printer’s WiFi module. Nice! Now how about those “winprinters” that have zero onboard “smarts” and rely on the host PC to control 100% of everything? They’re basically a stepper motor breakout board connected to a parallel port and the printer driver is specialized motion control software. The USB ones are a bit more sophisticated to deal with taking commands over USB, but the positioning of the paper and printhead and where the ink is applied is controlled by the host. i tried the same hack as i had an old broken wifi hp printer laying around. my wifi card is different from yours though. it is a broadcom bcm94319wlusbn4l card. it has got the same 8 pin setup. so i soldered a 3.3v regulator and a usb cable together. now lsusb only gives: Bus 001 Device 006: ID 0a5c:bd16 Broadcom Corp. Is this a dead end or do you have any sugestions on how to get this thing to work? i dont think there are any drivers but im not sure. I am trying to do the same thing, with the same device 0a5c:bd16 Broadcom Corp. Have you had any progress? 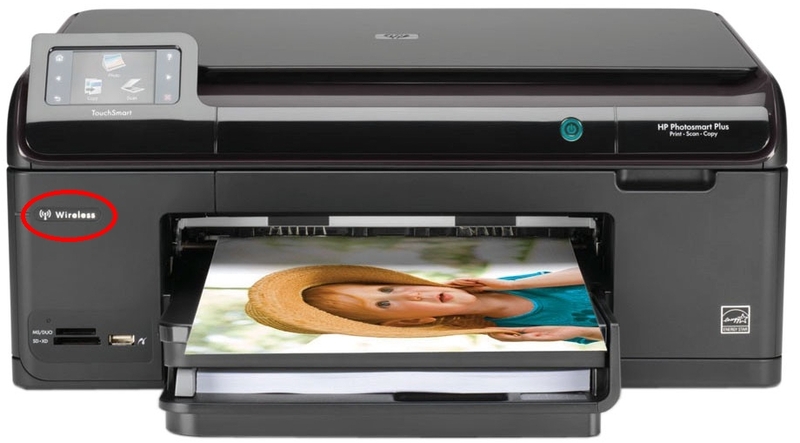 do you think it could be possible to separate the card reader and scanner from the dead printer? 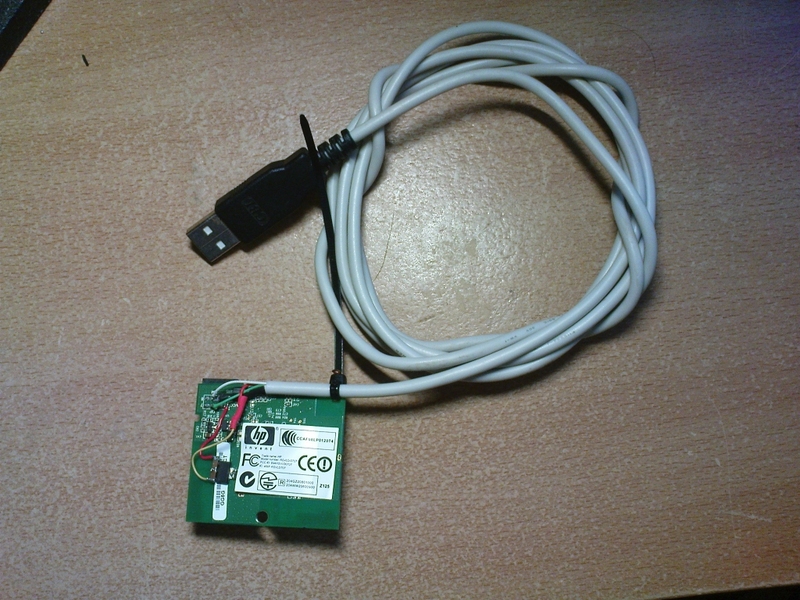 The specific printer didn’t use a distinct usb host chip via USB, SPI or a similar bus. It was using the usb host capability of the SOIC running a GNU/Linux flavor. So you can;t separate the card reader. The same goes for the scanner. Thanks for your answer, I wanted the reader for a project, and the scanner so I can ditch the rest, but I guess I will find it some room till I get another scanner. I had also one lying around and saw this post. hooked it up to my arduino trough the 3.3v pin and the rx tx. saw it on the screen as a 802.11b/g lp/sc usbless adapter. but it cant find drivers for it. any ideas? What operating system? Generally you must find the device’s PID:VID to locate driver. I am going to follow your instructions and try and hook mine up like you did with yours. How did you figure out that the module runs on 3.3V? Is the Voltage Regulator absolutly nessessary?? I also read somewhere that the module also works with SPI as well as USB. Please Email me back. any info would be greatly appreciated. I am new to this kind of hardware hacking and am eager to learn.. If I remember correctly, I plugged the main board to it’s power supply and measured 3.3 volts to the header of the module. If Raspberry-Pi has a 3.3 volts rail you can use, the regulator isn;t necessary. I don;t know for the SPI aspect of this module. thats actually a great idea. i also want to make a usb plug chord that i can use if i wanted to plug the unit into a desktop computer via usb. In that case i guess i would need the regulator. Thanks for the info and the quick response! The voltage regulator, or rather, a 3.3V current is absolutely necessary for the HP modules. I just got the same one running, was pretty quick, and my voltage regulator was shorted, so 5v was going to it, it shuts iff every few seconds, once I fixed it and had 3v going to it, it ran fine. You could power it off an arduino 3v pin, vut I am not sure how USB operates if you dont use power from the port, never looked into it. I have found myself a LD1117A resistor.. SOT-223 style.. http://www.st.com/content/ccc/resource/technical/document/datasheet/a5/c3/3f/c9/2b/15/40/49/CD00002116.pdf/files/CD00002116.pdf/jcr:content/translations/en.CD00002116.pdf it is similar to the one in the picture.. i am having trouble trying to get it wired. 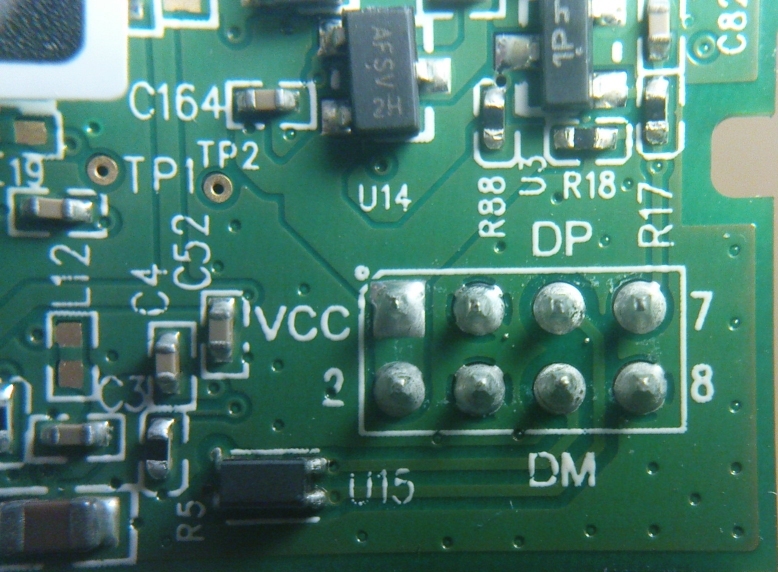 from videos online it shows they use all three terminals on the resistor.. in the picture above it only shows you connected to two of the three. can you elaborate on the wiring of your voltage regulator so i can try and wire mine? Thanks. 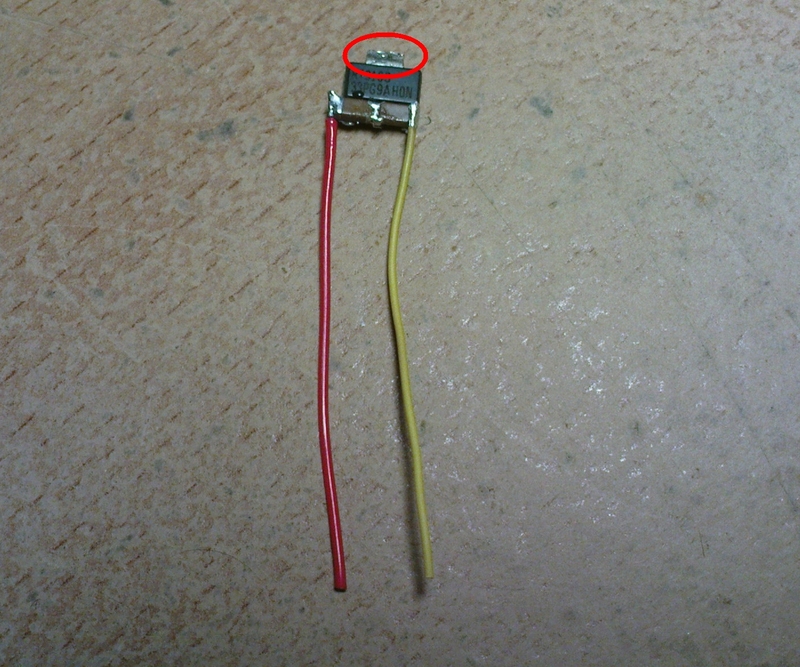 The heat sink (red circle) is the ground and it is connected directly to the middle pin. I have soldered the heat sink to the ground of the board. In your case though the heat sink is the Vout pin. You need the drivers for the module. If you successfully connect it to a usb port, then you can use the VID:PID designators to locate the appropriate driver. This all should apply to WiFi and possibly BlueTooth modules in many smart TVs, including the early ones from around 2010 or so that aren’t all that smart and most or all the apps are useless because the server side stuff is either gone or no longer supports the old app versions. May be USB connected wireless modules hiding in older BluRay players, same deal as with older TVs, apps useless because they’ve moved on to HTML5 etc. 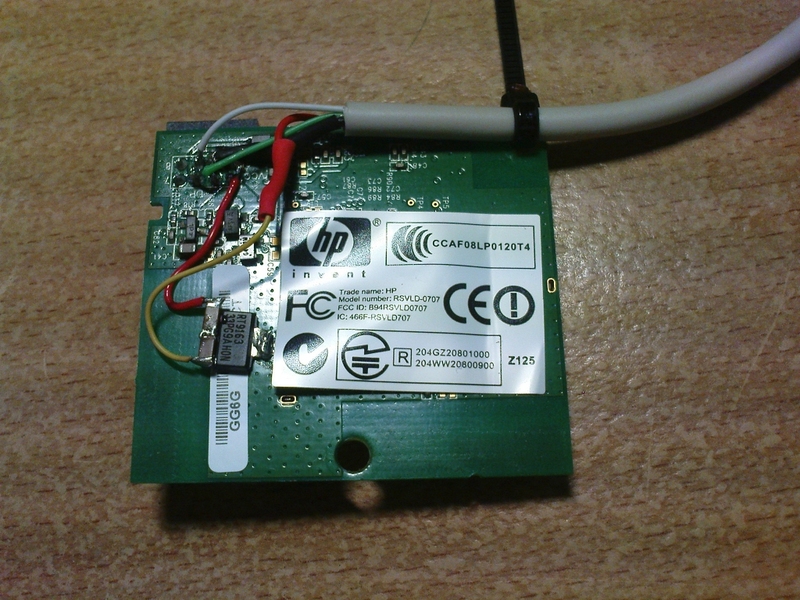 Several HP printers with cabled ethernet interface can be upgraded to wifi by connecting a suitable HP printer wifi module to the formatter board (given the board has the wireless port), I did it with a CM1415fn. Didn’t have to touch anything at all besides installing the board. I used the original USB cable, but for the CM1415 pinout onbboth sides is straight: 3.3VCC= PINS 1&2, GND = PINS 3&4, D+ & D- = PINS 5&6, ENABLE = PIN 7 AND GND = PIN 8, TWIST CABLE IN PAIRS 1&3, 3&4, 5&6, 7&8. usb N dongle is just a donut price, and usb AC is just 2 donut price! dont male your pc a joke! Besides being fun, doing stuff like this further builds your knowledge, brainpower and skills. Not to mention avoiding waste by not tossing useful functional electronics in the trash, AND potentially saving money. For the most part, the most recent generations don’t do anything like this and they’re becoming mindless ultra-consuming taxcattle as a result. Pure users with virtually no understanding of what they’re using. Corporation-engineered automatons. And your challenge should you choose to accept it: use this and an Arduino to make a “Wifi throwie” to act as a Mesh network. Extra bonus points if you use two of them and make a long distance repeater.